Quick slow-roasted pork | suppertime! I wanted to make some slow-roasted pork. Quick google. Ah, Nigella! Read recipe. Recipe tells me I should have put pork in oven this time… yesterday. Put the oven on to 150 C.
In a pestle & mortar, grind the fennel seeds, salt and rosemary. Rub sea salt into the scores in the rind of your pork. Heat a splash of olive oil in a roasting tray big enough for your meat on the top of the stove. Place your meat fat-side down and fry until the fat starts bubbling up and going golden. While it’s doing this, rub the salt / fennel / rosemary mix into the meaty side. Then pop it back in the oven for another hour or two – you’ll need to check on it from time to time to see that it’s not burning, and that the meat is cooked. It should be juicy and fall part when you pull it with two forks. When it’s cooked, whack the oven up hot. 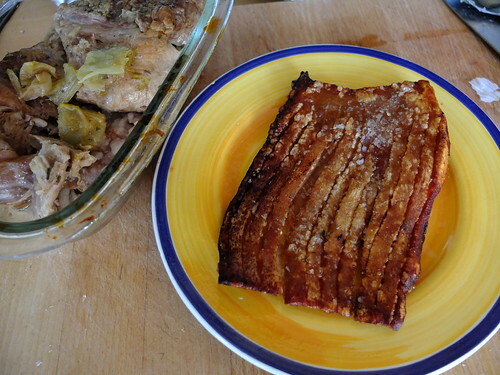 Take the tray out, and remove the crackling. Set the meat aside for later. Put the rind in its own small roasting tray and season again with salt and pepper. Cook in a hot oven for 30 mins or so. Remove, dry on paper towels and munch with a glass cider, while you wait for your roast vegetables to cook in the hot oven. Make gravy with the juices & veg left in the main roasting tray. Put it on the stove, sieve some plain flour in and stir in with a whisk until it thickens a bit. Gradually add half a litre of hot vegetable stock and a splash of soy sauce. Scrape all the bits off the pan and sieve into a gravy jug when nice and thick. Delicious. 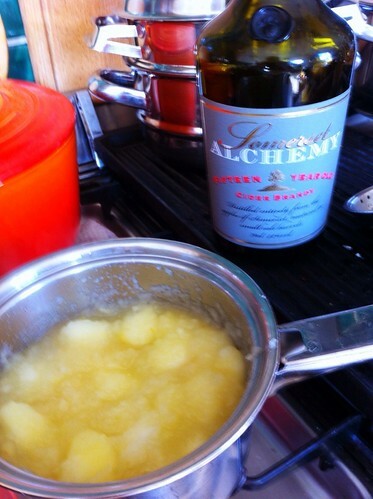 We had this with roasted potatoes, parsnips and butternut squash, plus sauce made with home-grown apples simmered with a little butter, sugar, water and a nip of Somerset cider brandy. The aroma was heady and heavenly. 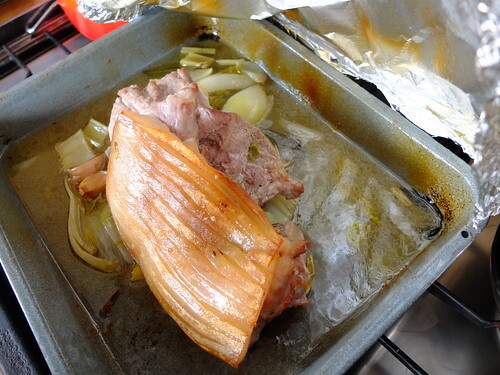 This entry was posted in meat, pork, Sunday lunch and tagged pork, roast pork, slow roast. Bookmark the permalink.